QQoM operates a varied and regular ride calendar across set days of the week, with rides to suit all abilities. All upcoming rides, whether set club rides or members rides, will be scheduled on the TeamApp. Cyclists joining the majority of our rides should be comfortable riding on roads, including main roads. Those who aren’t may join our Greenway Saturday Social. 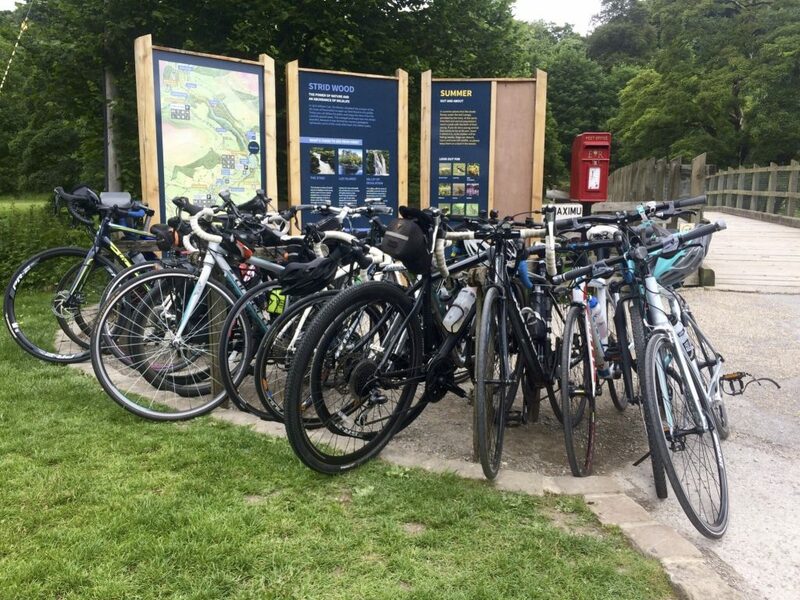 There are resources available to help new riders develop their skills; contact HSBC UK Breeze or CityConnect, both of which aim to encourage more people to get out on their bikes and offer safe and practical tips for beginners. Will I Be Quick Enough? 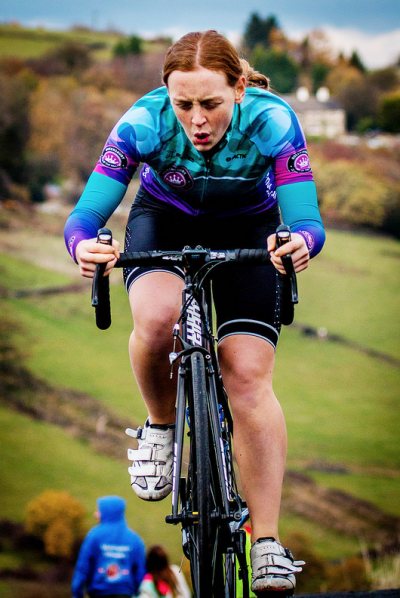 This is the most common question and barrier when joining a cycling club. At QQoM the answer is definitely ‘YES’. We have four ride categories which all have guide average speeds dependent on the terrain we are riding on. We also do not leave anyone behind. Our Steady group rides average around 11mph for a ‘Flat’ ride i.e. under 350ft of elevation per 10 miles to 5-6mph for a very hilly ride i.e. over 1,000ft of elevation per 10 miles. At the other end of the scale our Speedster group rides average 17mph for a flat ride and 11-12mph for a very hilly ride. Our Chaser and Catcher groups are somewhere in between. A full ‘Guide to Club Rides’ including speed, terrain, and types of rides can be found on Team App in the ‘documents’ section. Not sure about your speed and elevation why not try using Strava to track some of your current rides to see what sort of pace you ride at and over what elevation. 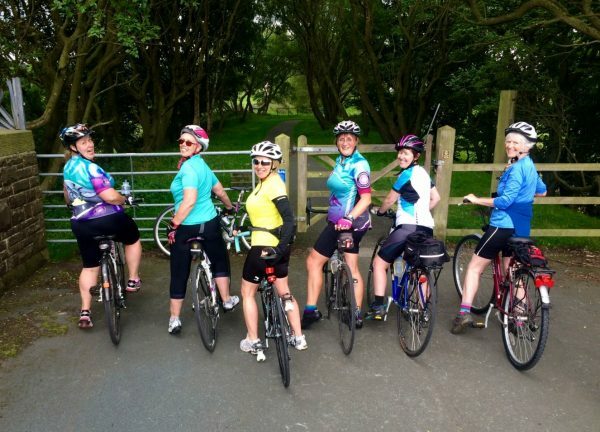 Or come and join one of our Wednesday evening or Saturday Social rides where experienced members can give hints, tips and advice on which rides will be suitable for you. A flat ride of approximately 18 miles along the Spen Valley Greenway with a café stop. These rides are ideal for any members who are new to cycling or don’t feel confident to go out on the roads. This ride will help to build your bike handling skills and confidence. 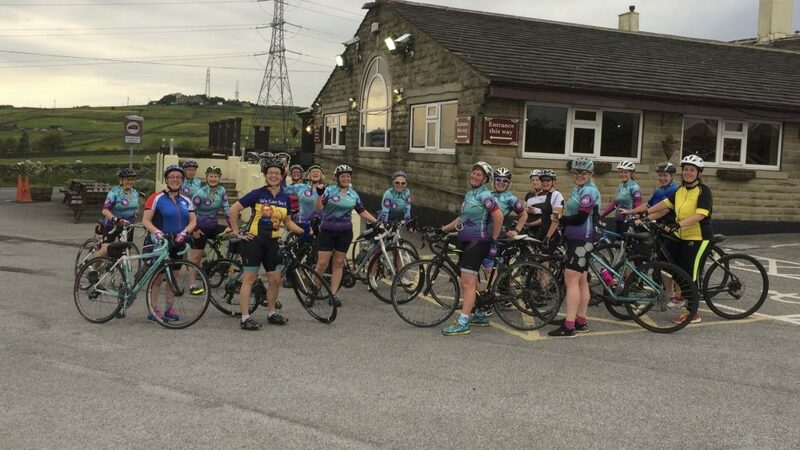 A hillier but still very social ride to the beautiful town of Haworth and back – approximately 18 miles. Groups are organised from attendees with experienced members leading and sweeping groups of varying pace. On arrival in Haworth we stop for a well-earned cuppa, cake and plenty of chat. Our most popular rides set off from Raggalds Country Inn in Queensbury. In the height of summer we will often have half the club turning up. 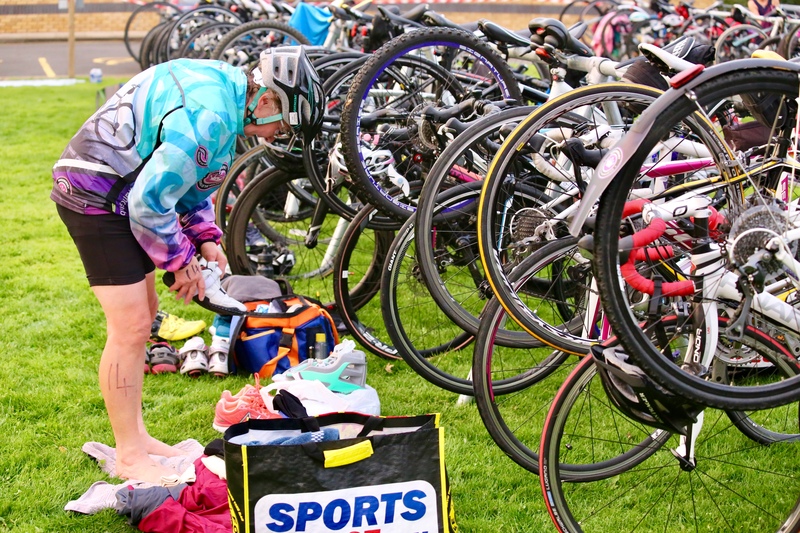 Rides are organised into our 4 different categories varying from 10 to 25 miles. With shorter, gentler options for our Steadies to longer, pacier jaunts for our Speedsters. And afterwards we generally make time for a drink in the pub and a good catch-up. As many of our members lead very busy lives, we encourage them to set up rides for the club that fit with their schedules. 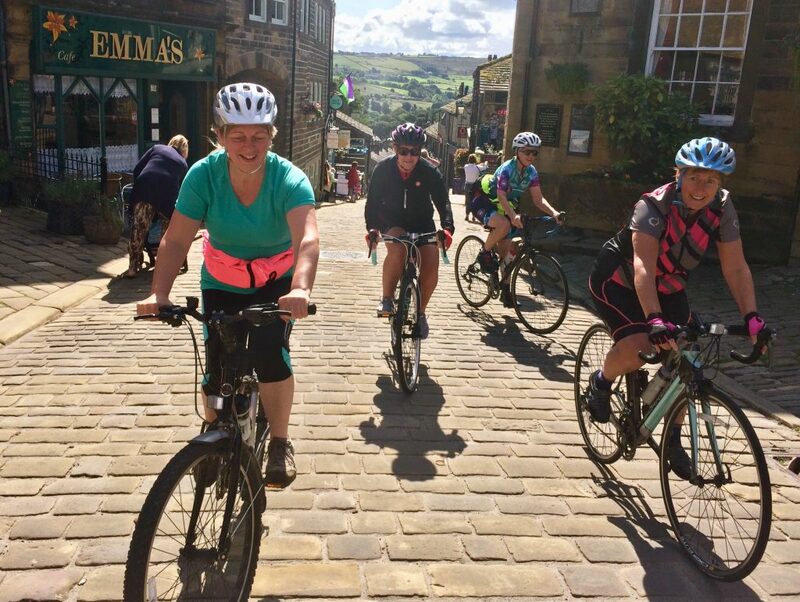 With everything from gentle canal pootles to social Friday catch-ups to weekend warriors heading out to explore the Dales both on and off road. There is always something for everyone. Can’t find what you are looking for then set up your own – you will be surprised how many Queens will be itching to join you. Members of QQoM are constantly looking for ways to challenge themselves from entering their first sportives to tackling a coast to coast. This year we have tried the world of hill climbing and next year we are taking our first steps into racing. Who knows what will come next! The supportive nature of the club has everyone achieving new goals and trying things they never of dreamed of. QQoM maintain a library of routes around Queensbury and surrounding areas through Ride with GPS.